Mario Mandzukic is to undergo surgery on a broken nose sustained against Olympiacos, Atletico Madrid have confirmed. The Croatia striker suffered the injury after being elbowed in the faced by Pajtim Kasami in the opening stages of the UEFA Champions League Group A contest at the Karaiskakis Stadium on Tuesday. 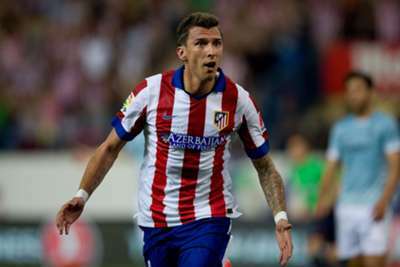 Mandzukic was able to play on for the entire match and found the net as Atletico were surprisingly beaten 3-2. Atletico have now revealed the extent of the former Bayern Munich man’s injury, although they did not confirm whether Mandzukic will miss any games. A statement on the Atletico website read: “Tests on Wednesday show Croatian Mario Mandzukic suffered a broken nose. The news means it is unlikely that Mandzukic, who has scored three goals since joining from Bayern in July, will be fit for Atletico’s home game with La Liga rivals Celta Vigo on Saturday.